Full Service Yarn Shop: Fight MS! Support Claudia! Long time spinner, knitter and blogger extraordinaire Claudia is doing the MS ride. If you send her a donation, she will put your name in a drawing for fabulous prizes one of which will be this! 8oz., 490 yds of mohair boucle hand dyed by yours truly! 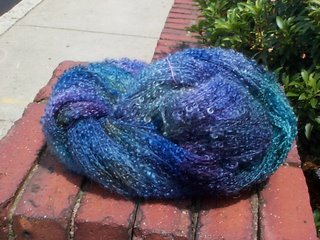 This skein sells in my shop for $50. I'll even include a poncho pattern if you would like. So pledge early and pledge often! It's a great cause!